Spring is in the air and before we know it we'll be ready to plant the garden. In recent years gardening has been catching on with a lot of people who have never tried producing their own veggies. (I'm thinking it has to do both with the state of the economy AND with people being more concerned about the health and quality of their food.) By growing your own, not only can you know that your produce is fresh and non-chemically treated, but it can save you a lot of money! 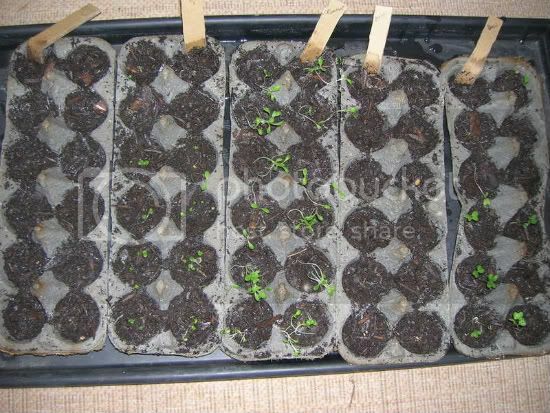 A cheap, easy and environmentally friendly way to start your seeds is by using cardboard egg cartons. To get started, cut the lids off the cartons. Then take the bottom portion and fill each cup with potting soil and add your seeds, placing them at the depth indicated on your seed packet. Place the cups on a shallow tray. You can use rimmed cookie sheets/jelly roll pans. I like to use an old plastic boot tray. Then fill the tray with water. The water will soak up through the cups. Cover the trays with plastic wrap and place in a warm sunny place. When your seedlings have sprouted and are ready for the garden, just cut the cups apart and plant the seedlings (cups and all) right into the soil!